All-Battery, online at All-Battery.com, is your ultimate source for total power solution. At All-Battery you’ll find rechargeable batteries and chargers. All-Battery offers a huge supply of different batteries among which are Li-Ion, Polymer, and LiFe batteries as well as NiMH/NiCd Rechargeables. 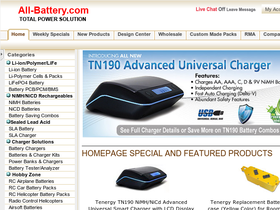 Also find charger solutions, battery packs, primary batteries, and even accessories. All-Battery also features a hobby zone, as well as a sports and travel zone. So check out the products offered at All-Battery and remember to stop by RetailSteal for the best All-Battery coupon codes, All-Battery discounts, and All-Battery promotions. All-Battery offers shipping with both USPS Priority Mail as well as Fedex. You can estimate the shipping charge with different shipping options at the home page. See website for full details, exclusions may apply. Use this coupon code to get 12% savings on your order from All-Battery. Use this coupon code to get free shipping from All-Battery when you spend $75 or more. Save 12% on your purchase from All-Battery.com using this coupon code. Click link to shop and save today. Shop All-battery.com and save $12 on your purchase $100 or more. Click link to shop and save now. Check out the clearance section at All-Battery and save up to 80% off a wide selection of products. Shop at All-Battery and get up to 80% off weekly specials. Click link for savings. Save up to 80% or more on car and travel DC adapters from All-Battery.com. Shop today. Shop at All-Battery and save up to 65% or more on battery chargers. Click here to shop and save on all your battery needs. Click our link to shop online at All-Battery today and use our coupon code to save 15% on power tool batteries. Use our coupon code at All-Battery online today to receive free shipping a $30 discount on Tenergy Li-ion 8000mAh External Charger/Power Bank purchases. Made for Android, iPod, iPhone and iPad. Save 10% on purchases from All-Battery online today when you use our coupon code. Click our link now. Shop at All-Battery today and save $5 on purchases of $50 or more when you use our coupon code now.